Improved powder liquid mixing for batch to batch consistency. The VACUCAM® Modular Dynamic Beverage Batching Stations offer the total solution to meet all of your mix room needs —for today’s immediate challenges and tomorrow’s changing requirements and capacity demands… NOW & FOR THE FUTURE. New Beverage introductions require new or additional process requirements. · To handle changing ingredients that cannot be mixed efficiently with traditional mix stations or mixing technology. · To handle bulk bag addition of ingredients as well as small packages for dry and liquid minors. · To handle the changing needs for sweeteners and addition of totally new ingredients. · Meet growing and changing demands w/ Modular additions to same system. · Build Total Sustainable process for ALL Mix Requirements. · Accommodate dry feed from paper bag, drums, bulk bag or bulk. BEVERAGE BATCHING STATION –BBS-100. EJM 100BB Mixer mounted on 500 liter batch tank w/ Air-Cone® hopper funnel. Provides rapid convey, mix and transfer of mix. DYNAMIC BEVERAGE BATCHING STATION available in Models DBBS 100, DBBS 150 OR DBBS 250. Dynamic Beverage Batching Station with continuous transfer of mix. Processes: Accommodates Single Pass; Batch and Transfer; and Continuous Steady State. ~ Module A.1-Dynamic batching w/ continuous steady state transfer and density control. Process accommodates continuous syrup making and transfer to storage or blend tank. ~ Module B – Dynamic Beverage Batching Station w/ addition of minor liquid additions – incorporates liquid dump funnel w/ spray ball. ~ Module B.1- Incorporates addition of drum wnd connected to Vacucam® Ejector Mixer as vacuum source. 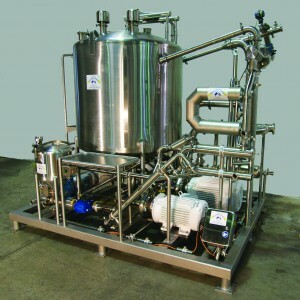 ~ Module B.1.1 – Incorporates addition of vacuum pump for unloading and transferring drums of liquid ingredients.